Incorporate live video content into any print brochure, mailer or card. 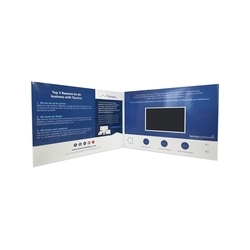 The video card offers an exciting way to share important information to prospective customers and partners by giving users quick presentation. It allows you to upload multiple pre-recorded video and audio messages into a full color mailer/booklet/card. The video card automatically plays the video when opened or you can select a play/ pause button option. The cards come with a rechargeable battery and a USB connector. The screen is 4.5'' IPS screen with resolution 720*1280 pixels, which will display your special video in a clear and vivid way. One USB Cable is included. Four colors imprinting.